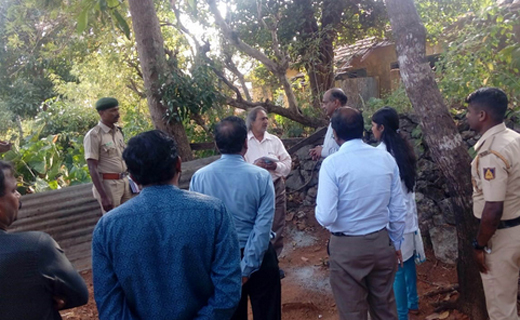 Udupi, Feb 08, 2019: A team of health officials from Bengaluru led by retired Chief Secretary of Health Department Madan Gopal has arrived in the district for a study on the Kyasanoor Forest Disease or Monkey Fever following the incidences of death of several monkeys in the district. The team also visited the places where the KFD virus was detected in the dead monkeys. The team members visited Hosangady and Siddapur where maximum monkeys were found dead. They also gathered details on the measures taken to check the disease. Meanwhile 950 bottles of DMP oil of 55 ml each have been supplied to the Kundapur Taluk Medical Officer’s office for distribution. A mobile health check-up unit has also been launched to create awareness, conduct medical check-up and provide medicines to the needy. The vehicle was flagged off by Babu Shetty, President of the Standing Committee on Health and Education of Byndoor. Precautions are better than cure.